William Dunlop has set out to change the world through his ‘demotivational’ philosophical system and has lowered his own expectations for success. Angered by the wave of ‘self-help’ gurus peddling advice to a consumer market of folks looking for answers to life’s difficult questions, William sets out to correct the misconception that we need experts to tell us how to be happy. He believes we ought to expect less out of life, and then we will not be so disappointed when tragedy strikes. Though a bit off the mark, he is trying his best to make sense of his own suffering. His demotivational speaking tour takes him back to the city where the seeds of his new philosophy are rooted. The Aim Low story is about one person’s attempt to come to terms with his own deeply personal tragedy. If there is any moral to this tale, it is that healing and hope often come from unexpected encounters and with family, friends, and even strangers. The remarkable thing about the tale of William Dunlop is how ordinary people can be extraordinarily remarkable. 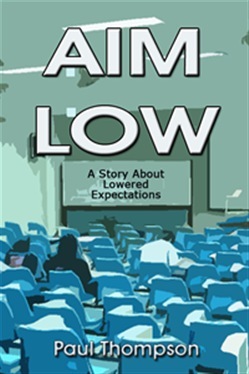 Acquista Aim Low: A Story About Lowered Expectations in Epub: dopo aver letto l’ebook Aim Low: A Story About Lowered Expectations di Paul Thompson ti invitiamo a lasciarci una Recensione qui sotto: sarà utile agli utenti che non abbiano ancora letto questo libro e che vogliano avere delle opinioni altrui. L’opinione su di un libro è molto soggettiva e per questo leggere eventuali recensioni negative non ci dovrà frenare dall’acquisto, anzi dovrà spingerci ad acquistare il libro in fretta per poter dire la nostra ed eventualmente smentire quanto commentato da altri, contribuendo ad arricchire più possibile i commenti e dare sempre più spunti di confronto al pubblico online.